Wonderfully addictive, cultural, and artistic -- sushi remains a mystery to the uninitiated. Why would anyone want to pay so much for a few tidbits of raw fish? Unlike the supermarket sushi slopped out by chains in the West, a true sushi experience is unforgettable and difficult to recreate. Masters in Japan know how to make each bite a ride of color, texture, taste, and presentation. If going for a proper experience, know the correct way to eat sushi. Hint: slathering each piece with soy sauce and wasabi isn't the best way! Although the Japanese get full credit for what we call sushi today, the inspiration for sushi is thought to have started in Southeast Asia. Nare-zushi, fermented fish wrapped in sour rice, originated somewhere around the Mekong River before spreading into China and later Japan. The modern-day concept of sushi was invented in Japan by Hanaya Yohei sometime around the end of the Edo period sometime in the mid-1800s. Once upon a time, sushi didn't require a platinum credit card to enjoy. Sushi caught on originally as a cheap, quick snack to eat with the hands while enjoying a theater performance. Forget the popcorn: pass the sushi! Real wasabi comes from the root of the wasabia japonica plant in Japan, not horseradish as is often substituted. The powerful burn of wasabi comes from naturally antimicrobial chemicals in the plant, the perfect compliment for killing potential microbes and parasites in raw seafood. Authentic wasabi is pricey; sometimes sushi restaurants even charge for it. The stuff often provided in mid-range sushi restaurants is made from horseradish and mustard powder then colored green with artificial dyes to resemble the real deal. Sour, fermenting rice was wrapped around aged fish only to aid in the process of creating umami -- a unique, sour taste. Once the fermentation process was complete, the rice was discarded and only the fish consumed. The fermenting rice also helped to preserve fish and to protect it from flies. Today, preparing the vinegared rice used for sushi is considered as important as preparing the fish itself. Nori -- the seaweed used to wrap sushi -- was once scraped off of wooden pier legs and even the undersides of boats. The scummy substance was then pressed into sheets and dried in the sun. Today, nori is cultivated and farmed. Western brands toast nori for safety reasons, while many Japanese brands don't bother and opt to protect the fishy taste. If the type of sushi precedes the word, "sushi" mutates into "zushi" in the Japanese language. For instance, maki (what we call a sushi roll) is maki-zushi; nigiri (rice with a piece of sashimi pressed on top) is nigiri-zushi. Fugu, or pufferfish, contain lethal amounts of poison in its glands and organs. If a chef inadvertently scrapes one with a knife while preparing sashimi, he could potentially kill his own customer. To be certified to work with fugu sashimi, chefs in Japan must undergo a rigorous training and certification process -- then eat their own finished product! And yes, there have been deaths during the final exams. For centuries, the only law pertaining to the Emperor of Japan is that he can never eat fugu because of the risk involved -- even on his birthday. Forget the standard "Californian roll" found at any cheap sushi outlet in the West. The ingredients for real maki-zushi (sushi rolls) are chosen by masters so that taste, texture, and even colors complement each other. Rolls are served already sliced into disks so that customers can see the artistic work inside. The bamboo mat that gives sushi rolls their cylindrical shape is called a makisu in Japanese. While sushi rolls are the most popular form of sushi in the West, the Japanese often prefer nigiri -- a piece of fish pressed on top of a strip of rice by hand. Maki-zushi has the advantage of allowing for other ingredients such as carrot, cucumber, or daikon to add crunch. Nigiri has the advantage of allowing the eater to dip only the fish side into soy sauce without destroying the rice (an important aspect of sushi etiquette). Although we are most familiar with sushi wrapped in black nori (seaweed), maki-zushi is sometimes wrapped in soy paper, cucumber, or egg in Japan. True to its origins as a simple fast food, the correct way to eat sushi is with your fingers. 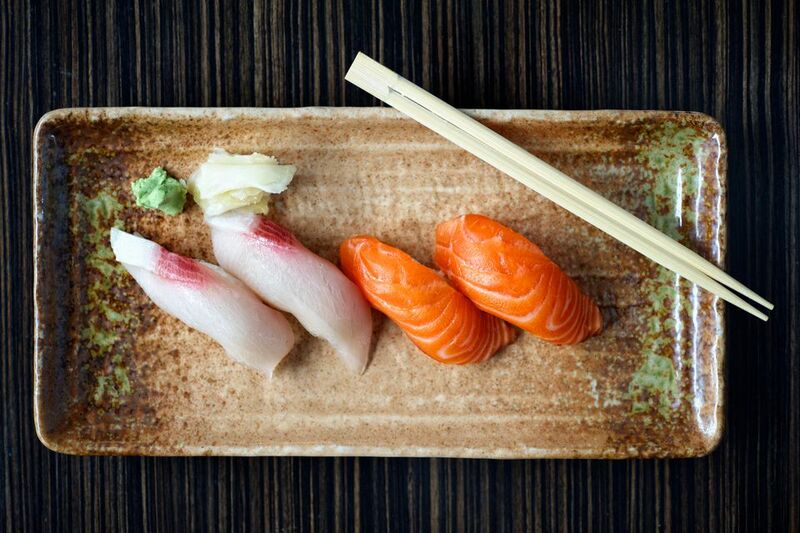 Chopsticks are typically only used to eat sashimi -- raw slices of fish. Food safety regulations in the U.S. and Europe require that raw fish be frozen for a certain amount of time to kill potential flukes and parasites. In Europe, raw fish must have been frozen at -20 degrees Celsius for at least 24 hours. Even the freshest raw fish served in Western sushi restaurants has been frozen, which damages the original taste and texture. Japanese sushi masters are trained to recognize potential problems such as flukes and parasites in the fish they purchase at the market. Making customers sick would be a terrible disgrace. Leaving behind a green, murky puddle of soy sauce with floating rice and remnants of your meal is extremely bad form. Wasting valuable soy sauce has always been frowned upon. To enjoy sushi the Japanese way, pour the smallest amount of soy sauce possible into the sushi cup and refill it as necessary. Don't mix wasabi into your soy sauce. If necessary, use a chopstick to lightly brush some onto each piece of sushi. Ultimately, you should trust your chef and his choice of seasonings that have probably already been applied. If you do need to dip nigiri into your soy sauce, you should turn it over and lightly dip only the fish. Great pride and effort is put into creating sushi rice that has the correct, sticky texture. Saturating the rice until it falls apart in your cup is an amateur move. Sushi prepared with toppings such as roe or sweet and spicy sauces -- unagi (eel) is one example -- should never be dipped in soy sauce. To fully appreciate an authentic sushi experience, avoid drowning every piece with soy sauce. Sushi connoisseurs recommend that nigiri, a slice of fish squeezed atop a strip of rice, is best enjoyed by turning it upside down to place the fish side on the tongue. Nigiri is typically eaten with the fingers rather than chopsticks so that you can keep it together and rotate it easier. Give it a try! At the end of an authentic sushi experience, you can offer to buy the chef a shot of sake in gratitude. If he accepts, you should have one with him. Aside from the shot, avoid distracting the chef with small talk or questions about the food -- he needs to focus on the sharp knife in hand! If your shot is declined, which it may very well be, simply bow politely in gratitude. No matter how great the experience, don't try to hand over extra money! Tipping in Japan is not common and can even be offensive if done incorrectly.